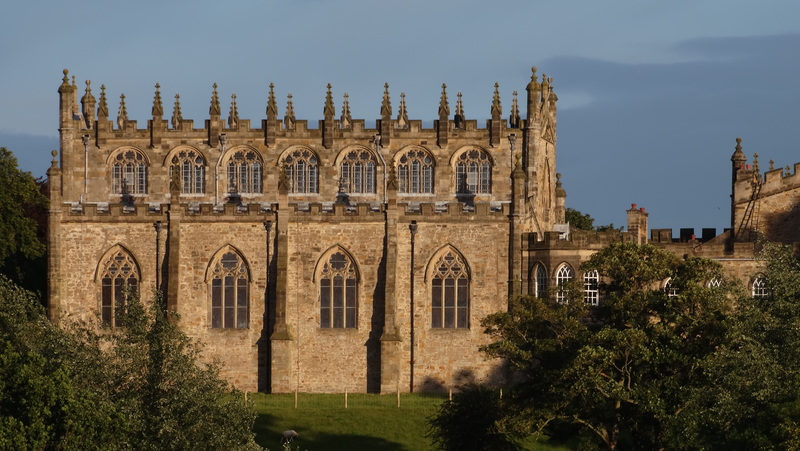 The Saturday evening sunlight softly illuminates the glorious Gothic splendour of Auckland Castle as it awaits the unfolding of a great event from its lofty vantage point amidst the neatly manicured trees of the ancient bishops’ park. Close by, the ornate spire of the Franco-Flemish town hall peers above the treeline adding another beautiful backdrop to the verdant setting of an almost fairytale landscape. Only the occasional chill of a July evening breeze sweeping across thousands of knees and the stark outline of a 1970s office block high above the valley (far enough away not to intrude) keep you grounded with a sense of reality in the present time and place. Yet even the office block seems like some extravagant addition to this extraordinary setting in which an epic two-thousand year tale of England is to be told. 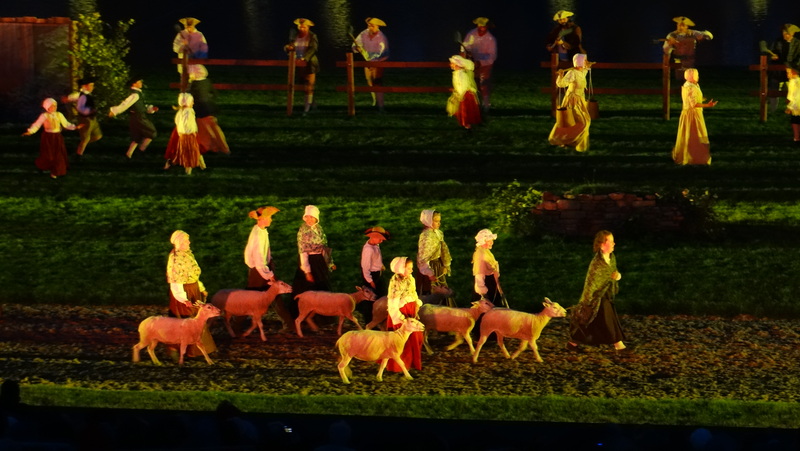 Welcome to Kynren – an epic tale of England. We wait, not quite sure what to expect, comfortable in the back row of the tribune. It’s the grand name for an auditorium of some 8,000 people but this is after all a daringly grand event. The wooden facade looms like some grand medieval citadel as you walk the winding yellow road to reach the setting, leaving your car behind, at the bottom of the hill – in Toronto. It’s just the beginning of a wonderfully implausible adventure. It’s nearly 9.30pm. The moment approaches and an announcement is made: there will be a delay of ten minutes. A rumble of polite laughter rolls across the crowd. They know that this is the very first night for the volunteer performers, drawn from across the local community, children and adults alike. The expectant crowd is prepared, perhaps, to forgive the occasional glitch. They need not worry for despite the delay we soon see that the show, the spectacle, whatever we may call it, is in very safe hands. “What’s this thing called again?” my eleven-year-old daughter asks, in slightly half-hearted fashion before it begins. She was looking forward to a friend’s birthday the following morning so this “history thing” had received little interest up until now. “KYNREN” I say, spelling it out not once but twice as she texts friends to explain where she is with a rather puzzled look on her face. Kynren is Anglo-Saxon for ‘generation’, kindred, family’ and this epic show is designed to tell the story of generations of England’s history over two millennia, with much local flavour thrown in to taste. It’s an extraordinary challenge if ever there was one but we would not be disappointed. And so the dream commences and a dream it surely is. 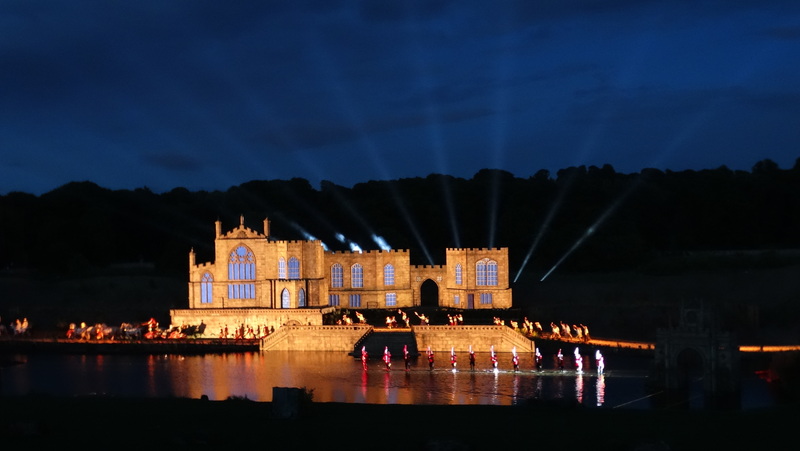 The Kynren concept had all begun with the visionary dream of a City of London investor and philanthropist, Jonathan Ruffer, now the owner of Auckland castle, whose plan was to recreate the spectacular French outdoor shows of Puy du Fou, right here in the North East of England. Ruffer, born in Stokesley in North Yorkshire, just a little outside Middlesbrough, hopes to bring regeneration and a new sense of pride to Bishop Auckland and the surrounding area and in this he will surely succeed. ‘Bishop’ as it is affectionately known, is the focal point for much of what was once the coalfield of south west Durham and was a place much affected by the rise and fall of coal mining. It is also a place with much potential and like many towns across the region, has seen something of a rebirth. It is a town with quite obvious medieval roots just like its medieval neighbours at Durham and Barnard Castle and it lies in beautiful surroundings too with a history stretching back to Roman times. Sadly, it is too often overlooked by visitors who mistakenly believe it to be just another mining town as they head out towards Bishop’s historic neighbours. With millions of pounds invested, this is Bishop’s chance to shine. In both the execution and storyline, Kynren is something of a dream in itself. Perhaps it is even a dream within a dream – a spectacular stream of multicoloured consciousness, where the amazing events of twenty centuries, both local and national, flow swiftly from one into another at a captivating chronological pace. Let’s be clear, though, this is no history lesson, it’s much more magical than that. Surprisingly, the River Wear is the setting for much of the story and in often unexpected ways. It serves as the sea in several scenes and when it comes to technical effects has a major starring role in the show. It’s a role that it comfortably fulfils along with the grand castle that overlooks its river banks. It’s not the real river, though, but a magical man-made lake and it’s not the real castle either. Yet dreamily, the whole of the Kynren site is set within a broad loop of the real-life River Wear itself overlooked by the real-life castle. Don’t be confused and you won’t be. As I said, this is virtually a dream within a dream. When the show finally kicks off, in football fashion, the audience is instantly captivated. I’m delighted to see my daughter immediately relates. She is enthralled. It’s a story told through the dream of a young Bishop Auckland boy, a miner’s son during the inter war years of the last century. Befriended by Hensley Henson, the Bishop of Durham, after accidentally breaking the window of the bishop’s lodge, the boy’s fascination for history is quickly kindled by the bishop’s passionate knowledge. The boy’s name is Arthur, the first hint that Kynren is to be as much a tale of legend, mystery and magic as it is a one of history. As a historian and father to a girl who says she finds history disappointingly dull, I am rather relieved. There’s no need for me to constantly assess the accuracy of the facts – though most prove to be broadly true – and I don’t feel I have to inspire, or bore, with my insights or quiet narration as events unfold. This is a dream after all. It is theatre not a lecture. And yet the questions fall one by one: “who’s going to win this battle?” or more often “who are the bad guys? who are the good ones?” I explain, pragmatically that it’s usually the good ones that win or so history often tells us. So how much should I reveal about this truly wonderful spectacle? Well, firstly you simply must go and see it for yourself and hope that it does not rain – though it would take much to dampen the spirit of Kynren. What I can say though is that you should expect the unexpected and also expect, with so much happening, to miss almost as much as you will see. In fact you may want to watch it all over again. There will be bangs and the flashes of fireworks too, so you’ve been warned. Romans, Angles, Vikings, Normans, Tudors and a whole assortment of kings, queens and common people of many different eras will come and go in scene after scene as whole epochs flash past your very eyes. Scores upon scores of colourful, costumed characters, children, armies, live goats, sheep, geese, slaves, soldiers, peasants, knights, show-stealing horses, carriages, carts, ships and even a steam train will appear and disappear from nowhere and into nowhere as you count down the years and move closer to the present. Distracted by colourful events in one corner of this splendid seven and a half acre stage, you may turn to see that you have missed the appearance of a whole building in another corner or perhaps a ship or an army. It is really quite something, like an epic Hollywood movie set, with a wonderful technicolor cast of some 1,000 souls. You will see live battles, fabulous fireworks, water effects, magnificent creative lighting of a kind with which Durham is now so familiar and you will soon take for granted the magic of people walking on water – Dynamo style – or a whole ship emerging from the water complete with its Norman crew. “How did they do that?” you will wonder and you will surely ask yourself “am I really in Bishop Auckland?” Often you will utter to yourself “this is just plain mad”. The amplified stories of the past are spoken by actors of all ages but this story as it is told is almost incidental to the whole visual effect and the accompanying, specially composed music. It is unashamedly and rousingly patriotic in places but never in a jingoistic way. It will leave you feeling good and is perhaps just the tonic if you wish to escape from the weary world of present day politics. If you love the costume character magic of Beamish, or the lighting effects of Durham’s Lumiere, or the atmosphere of open air theatre and especially if you enjoyed the wonderful absurdity of the opening ceremony of the London 2012 Olympics, then you are in for a very special treat here. It’s not just me that thought this though. The standing ovation that brought the show to a close is a great testament to the many months of planning and work that have gone into this magnificent event. As we drove back home towards the midnight hour, my daughter confessed with brutal honesty that history was her most boring subject at school and apparently even the way I explain it is rather boring too. “This was amazing though”, she declared, “it made history so exciting and so real” she then continued listing her favourite parts of the show one by one by one in yet another stream of flowing dreamy consciousness. For such inspiration, Kynren, I am eternally grateful. You are absolutely correct. This show is amazingly beyond belief! Wow!! Thank you so much for this lovely piece . I’m a cavalry team volunteer, not one of our awesome riders but , nevertheless , a very proud supporting member. It’s almost impossible to express how the experience of being an “Archer” makes you feel. It has been a gift like no other and to read lovely comments like yours chokes me with pride. I believe, as happened with Pouy du Fou in France , that we are the pioneers of something incredible to come…..
All the Archers at Kynren are so pleased and happy that you, your daughter and so many thousands of others enjoyed, thrilled and marvelled at our baby. Your words really do capture the essence of what we hope to provide for all our guests from the great and genuine Northern welcome right through to waving you a safe goodbye. We want it to be a World Class experience rather than ‘just’ a show. We will keep our secrets as to how the magic happens but perhaps let slip that the real heart and secret is that everyone involved whether on stage, welcoming our guests or backstage has become a community who genuinely love Kynren – the show, the experience and what it heralds for the entire region into the future and that extends to all of our guests. Thank you for being part of history, we look forward to seeing you return and maybe getting a glimpse of those little and not so little surprises which can be missed with so much happening around you. Thank you for such an insightful review as one of the volunteers, it is nice to know our months of preparation are so well received. A performance for all the family no matter how young or old….you will find something in this performance that really touches your heart and makes you proud to be English. Remember to keep your eyes peeled throughout your visit as there is that much going on. Im in the show and your comments and reflections are pleasing and uplifting. I hope many more will enjoy this magical, historic experience. As a member of the cast and on team 3 I am just astonished at the fabulous feedback from everyone who has seen Kynren. I have and still am having such fun being a part of this truly world class show. Beautifully and very elegantly put, I am one of kynren’s back stage cavalry team volunteers and couldn’t be happier at how much everyone enjoyed the show; each and every volunteer in kynren on stage and behind the scenes put our hearts and souls into making this show a success, it is a labour of love and being a part of Kynren and reading this has made me feel so proud to be a part of the beginning of a very bright future for Bishop Auckland and the region. I am also in the show. Thank you, thank you ,all our hard work has been greatly received. I feel so proud to part of kynren. The reviews are fantastic and it has brought tears to my eyes to read them. I love the fact that history is coming alive and it helps young and old to understand the history of England . It’s great to see that Kynren is being so well received. I look forward to getting to Bishop Auckland and viewing the show.